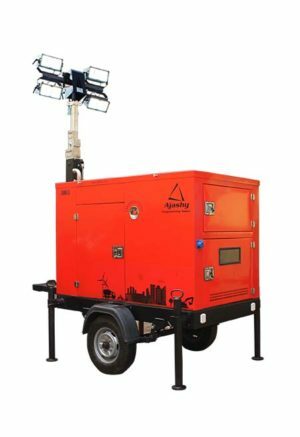 Hybrid Lighting Mast is a movable lighting source which is powered by a diesel engine and rechargeable power generation system. This hybrid system cuts on fuel consumption, green house emissions and noise pollution and also extends the diesel engine life. The output light is derived using LED lights which are cost effective, energy efficient, have longer lifetime and are environment friendly. These can be used at construction sites, infrastructure projects, airports, playfields, schools, public functions and at any other site where illumination is required. Cost effective and environment friendly Hybrid System. 4 hours power back up after 4 hours engine running. Efficient and high performance 120 Watt x 4 IP 66 LED lights with longer service life. Compact and high performance 5 HP Greaves Engine. CPCB – II compliant solid silent canopy. 5 section 7 m galvanised iron mast 340 degree rotation. Longer hours of continuous operation without fuel fill. Provision to operate lights and charge rechargeable system from external power source. Power point to tap power. Leaf spring mounted chassis with towing hook and towing speed upto 40 km/ hr. Compact design with lifting hook for easy transportation. Multi-display control panel with alarms and sensors.